I love living in a new area and exploring places nearby. Silverlake used to be a far-off land only visited infrequently, but now I find myself there almost every week braving the throngs of hipsters who threaten to overtake the neighborhood with their skinny jeans and combat boots. 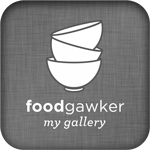 There are a ton of great restaurants in the area. 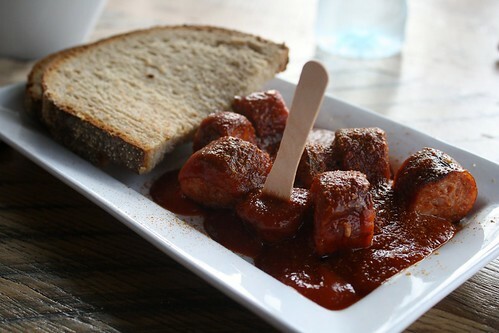 One of the newer additions is Berlin Currywurst, an outpost where one can nosh on the famous German snack. According to Wikipedia, for those not in the know, currywurst is a pork sausage which is sliced and topped with a curry sauce. In most cases the sauce is ketchup mixed with large amounts of curry powder. Berlin Currywurst has four levels of heatness for the sauces. You need to be over 16 to get levels 3 and 4 because they are supposedly "that hot". There are a variety of sausages with which to have your spicy sauce. There's everything from pork to chicken, beef, and even tofu. I'm all about big flavor so I had the paprikawurst which is a pork sausage flavored with paprika and garlic. Since I have a high tolerance for heat, I ordered mine with level three sauce. My dining companion chose the Bockwurst (pork and veal) with level two heat (wimp). Neither of us added any additional flavors to our wursts. We split and order of the fries topped with onions between the two of us. I loved the salty pork with the sweet, spicy curry. I didn't find it to be overwhelmingly spicy and I will probably order a level four the next time I go back. I felt the pieces of bread on the side were superfluous given that by the time we finished our sausages, the sauce was kind of cold and we didn't feel like dipping bread into the cold sauce. The fries were a thicker cut than I normally prefer, but not off-putting to me and a nice change of flavor in between bites of sauce and sausage. There's no liquor license yet so the only way to cool your mouth between bites is with water, a few options of natural sodas, or chocolate milk. 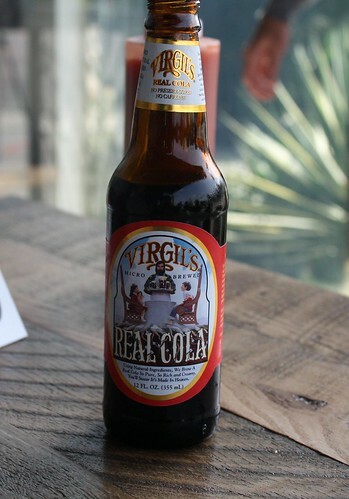 I'm not a big soda drinker, but I really enjoyed the few sips I had of Kris' Virgil's cola. It was kind of like a cross between cola and root beer. The restaurant is small and seating is extremely limited. We were lucky enough to snag a table outside almost immediately, but we rushed through finishing up our meal because of a group waiting to sit down. I'll definitely be back at this tiny gem, but hopefully the crowds will be kept at bay so I can enjoy my spicy sausage in peace..or else I can just get it to go. I love how they offer such a wide variety of sausages! Makes it the perfect spot to bring a group. I wish we had a place like this near us! My husband and I travel to Germany and Austria a lot, and we always get currywurst. I always think the bread with this particular sausage is strange, too, since you don't really wrap it around the sausage like you might with other types. I had no idea... so many fun and unique versions to try... I cant wait! Thanks for sharing these!!! I've heard about currywurst but never tried it. I love that they have a tofu option and heat level options. Sounds like fun! I've heard of this currywurst business before but have never actually encountered it myself. Anything smothered in curry sauce sounds sort of wonderful to me! Wish we had a restaurant like this near us! I love the way you roll, Esi! You are my idol! 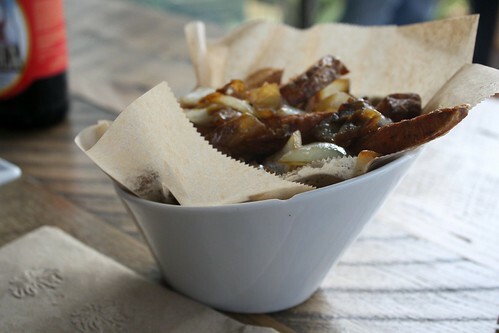 The fries topped with onions especially sound good! Do you think I'm woman enough for level 3 spice? Okay, Esi, I have to ask a fashion question. I know skinny jeans are in, but combat boots? I must have missed this one. Yum. I've never heard of currywurst but this seems so modern and interesting! Who was this mystery companion? Was he handsome? Dishing Up Delights by Esi Impraim is licensed under a Creative Commons Attribution-Noncommercial-No Derivative Works 3.0 United States License.